Space heroes watch out! Are you ready to set off for distant galaxies in the spaceship you made yourself? Good – because in space there are many challenges awaiting you. 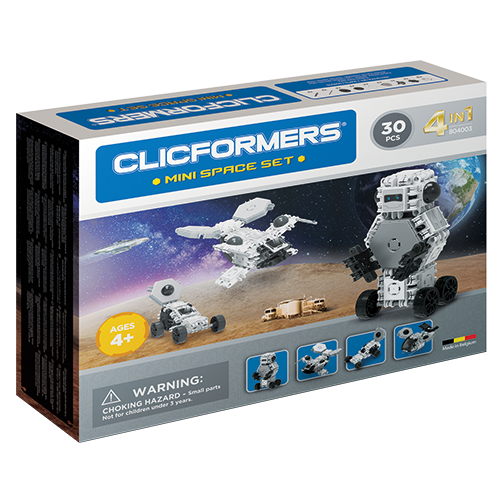 With this Mini Space Set of Clicformers, you can do all of this! With the 18 building blocks and 12 accessories you can build your own space creations. Difficult? No, not at all! You can build everything smoothly using the supplied booklet. Release the exploration robot in space and discover what the universe has to offer. 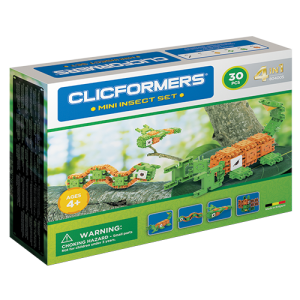 Clicformers is suitable as toddler toys for children starting age 4. And because Clicformers is a smart toy, it keeps on fascinating. Which means that this toy grows with your child. More complex constructions are built again and again by clicking the blocks and accessories in different ways. Clicformers is therefore very sustainable and resistant to years of building, disassembling and rebuilding. So it’s construction toys in its purest way, with the only risk that your children won’t get enough of it. Let’s be honest : that’s what fun toys are all about.